In the 1980s, tourism promoters in B.C. encouraged towns to develop some kind of landmark to put themselves on the map. Many communities were coming up with ideas: there already was the World's Largest Pair of Skis and the Largest Goldpan in the World. The story is that Warner Jarvis, an avid local fly fisherman, was at a tourism workshop sponsored by the Chamber of Commerce where ideas were being tossed around as to what could be a distinguishing feature for Houston. During the coffee break, Warner suddenly said, "I've got it!" With the rest of the group watching, he proceeded to sketch out an idea on a paper napkin, and the idea of the Canada's Largest Fly Rod was born. Warner's vision slowly took shape. Andrew Knappett drew up the plans and did much of the design work. John Hols coordinated the construction of the rod portion of the project, with components first going to local machine shops, then to Vancouver to be anodized. Volunteers donated countless hours of time and effort in the construction. The rod was machined in six local shops with 470 hours of donated equipment and shop time and 576 hours of donated labour, with 41 local companies contributing to the final package. The rod is constructed entirely of aluminum and anodized bronze to simulate graphite. It is 60 feet (1829.8 cm) long and weighs about 800 pounds. The reel has a diameter of 36 inches. Warner Jarvis, with the help of Ray Makowichuk and others, spent many hours experimenting with ideas and finally coming up with the line and fly for the rod as well as all the finishing touches. The fly is a fluorescent orange "Skykomish Sunrise" and is 21 inches long, tied on a bright 5/8" floating line of hollow plastic with a tapered leader (weed-eater cord and 300 test tip). A nail knot and a blood knot are used on the rod. The rod was installed in a gala event on May 5, 1990. 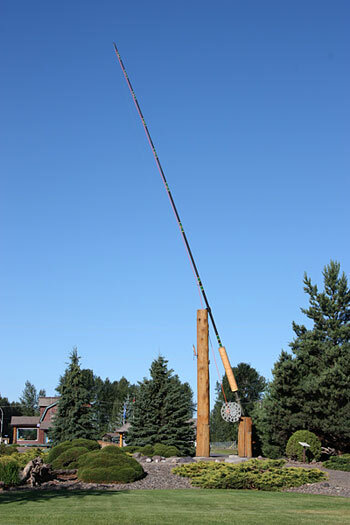 The many people who had helped to construct the rod carried it on their shoulders from the Industrial Park to its location in Steelhead Park. Highway 16 was closed for the duration. The rod can be seen in a natural setting in the park. It is illuminated at night. Dedicated to the people of Houston, Canada's Largest Fly Rod has, over the years, been photographed by countless tourists, and continues to draw attention to one of the best fishing spots in B.C.